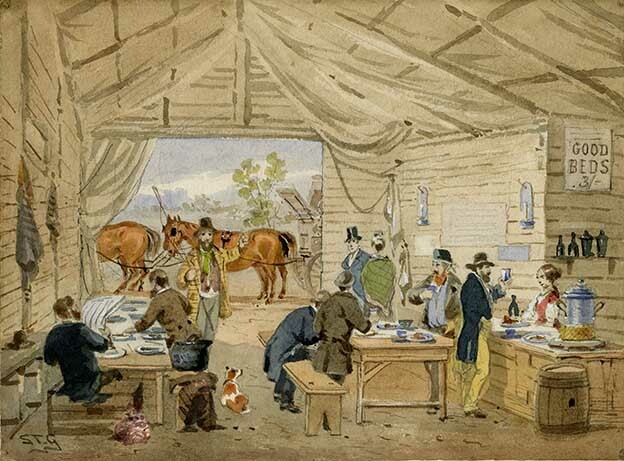 Samuel Thomas Gill, Refreshment Shanty, Ballarat, 1854, watercolour and gum arabic on paper. Art Gallery of Ballarat, gift from the Estate of Lady Currie, 1963. Many Americans on Victoria's goldfield had experienced the Californian goldfields of 1849 bringing with them technical experience for winning gold from the ground. ORIGINAL CORRESPONDENCE. THE GOVERNOR AND THE FOREIGNERS. 1. —— imprisoned at Geelong for sly-grog selling, pardoned by the Governor avowedly as an inducement to the Americans at Ballaarat to keep quiet during the agitation. This case was made public by the Governor himself in a way which suggested very painful reflections in the minds of many as to his Excellency's boasted "honesty" and good sense. 2. —— arrested, along with Fletcher, M'Intyre, and Westerby, for setting fire to Bentley's Hotel, and with them committed for trial. It was re- marked, however, that he was not tried, and, on inquiry, it was found he was an American. For this case the Attorney-General may be held responsible. 3. —— was caught fighting in the Eureka Stockade, and carried to the Camp. Had the command of a company, and held the rank of sergeant. Was engaged in drilling the diggers during the agitation. Sergeant —— has not been committed for trial. He, too, is an American. 4. ——, commonly called "General ——," drilled the diggers during the memorable three days prior to the Eureka affair, during that time sported Commissioner Amos's horse. Boasts of having shot Captain Wise. Is known to the Government, but has not been apprehended. He says that he has got an amnesty for himself from the Governor, and that since his case has been referred to, he has received a hint from the Governor to make himself scarce. I state these particulars as they are circulated, and as I believe they can be proved. They require no comment. They do no injury to the Americans, who are likely to feel themselves highly flattered by being singled out for such distinguished consideration. What does his Excellency say to these accusations? How does he reconcile such conduct with his famous inaugural speech, when he vowed that he would turn neither to the right hand nor to the left? If these reports were confined to a limited circle, I should not ask you to publish them , but, as they are the talk of the town, they should be either authoritatively contradicted or, if true, the Governor should be taken to task. 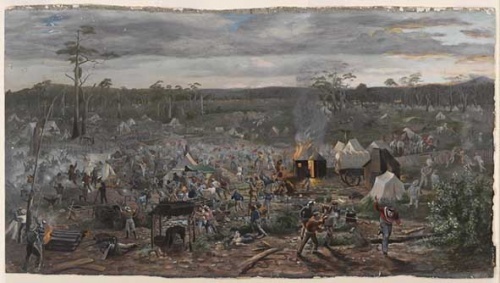 This work is an over-painted photographic print, photographed by an unknown photographer from the painted canvas by Izett Watson and American Thaddeus Welch, which was exhibited as a painted cyclorama in the 'Battle of Waterloo' Cyclorama building, Fitzroy, ca. 1891. This is based on the evidence that the pulleys and brick wall are discernible at the top edge of the image which B. Ireland has not over-painted. Many people dug for gold in California before sailing to Australia. 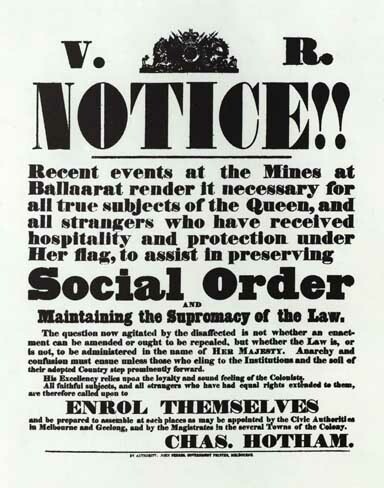 ↑ Eureka - A Multicultural Event by Dorothy Wickham and Clare Gervasoni, https://ballaratheritage.com.au/article/eureka-a-multicultural-affair/ accessed 22 February 2019. ↑ Cornwall Chronicle Launceston, 09 December 1854. ↑ Argus, 22 January 1855. This page was last edited on 22 February 2019, at 05:44.